Today’s bathrooms can be so much more than a place to shower & brush your teeth. Your bathroom can be a sanctuary—a place to relax and unwind; a place where you can luxuriate in a bubble bath; and even a place where you can get away from the kids, if you need a few minutes of “me” time. Elegant furniture: Sometimes, the real standout in a bathroom is the furniture. Elegant pieces such as a modern display cabinet can take your bathroom from average to the inspired. Vivid colors: When it comes to paint, why not go a bit bold, with a subtle dose of color. Vivid colors add a nice touch, but shouldn’t be too overwhelming. Textured walls: Wallpaper is being used more often, and some of the modern designs are simply gorgeous. If you don’t like wallpaper, textured tiles can give the space an immersive, visual appeal. Updated Southwestern: Southwestern style is colorful and funky, perfect for people who want something a little unusual. The problem is, a lot of Southwestern decor can feel a little ... kitschy; but it doesn’t have to be. A terra-cotta bathtub and sink paired with teal walls can give you a modern version of this look. Wood floors: Wood floors in the bathroom used to mean impossible upkeep, but not anymore! Now you can buy ceramic or porcelain tiles that look exactly like the real thing. Embellished ceilings: If you’ve been ignoring your bathroom ceiling, you’re missing out on a great opportunity to add some visual appeal. An exposed wood ceiling absolutely pops against neutral tiles. Exotic themes: Colorful ceramics can spruce up any space, adding an exotic flair that will make you feel like you're permanently on vacation. Big, bold, and beautiful tiles can create a beautiful focal point. At Maria Causey Interior Design, we guide clients in outfitting bathroom finishes with style so that tile schemes, tub, vanities, backsplashes, and faucets all complement each other beautifully and align with your personal style. 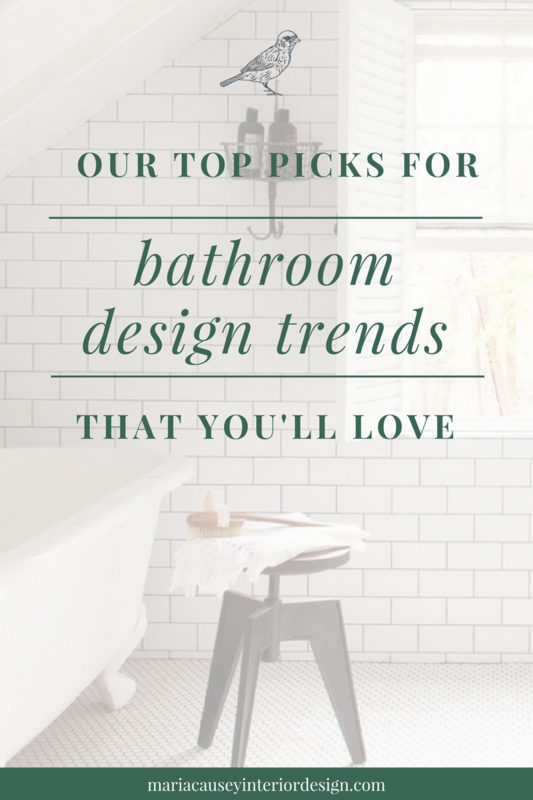 Since your bathroom should truly create the mood you desire, we want to help you to make design choices that will last. For more information or to receive a proposal for your next interior design project, please contact Maria Causey Interior Design today.